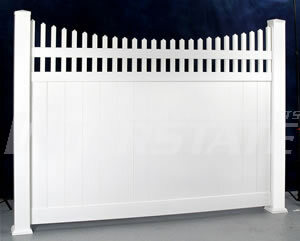 We offer a full line of vinyl, or PVC fencing in various styles. Many of our clients prefer this maintenance free alternative to traditional wood fencing. Polyvinyl Chloride (PVC) was perfected by Waldo Semon and the B.F. Goodrich Company in the late 1920's. Since its development, PVC has been used increasingly in construction products for its relative low cost and durability. PVC, or vinyl fencing has gained popularity for its long life expectancy and maintenance free finish. 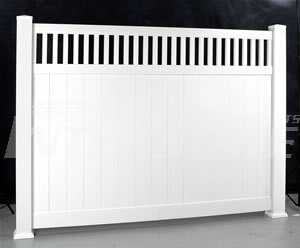 Your PVC fence will never have to be stained, painted or sealed; just wash off dirt or other build-up and your fence will look new for many years!